The Dadaab refugee camp is many things: to the charity workers, it’s a humanitarian crisis; to the Kenyan government, a “nursery for terrorists”; to the Western media, a dangerous no-go area. But to its half a million residents, it’s their last resort. Situated hundreds of miles from any other settlement, deep within the inhospitable desert of northern Kenya where only thorn bushes grow, Dadaab is a city like no other. Its buildings are made from mud, sticks, or plastic. Its entire economy is grey. And its citizens survive on rations and luck. Over the course of four years, Ben Rawlence became a firsthand witness to a strange and desperate place, getting to know many of those who had come seeking sanctuary. Among them are Guled, a former child soldier who lives for football; Nisho, who scrapes an existence by pushing a wheelbarrow and dreaming of riches; Tawane, the indomitable youth leader; and Kheyro, a student whose future hangs upon her education. 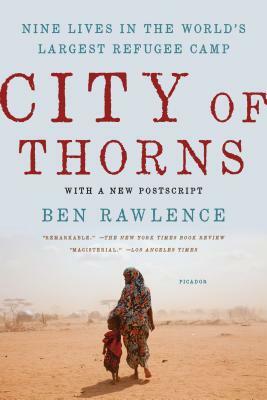 In City of Thorns, Rawlence interweaves the stories of nine individuals to show what life is like in the camp, sketching the wider political forces that keep the refugees trapped. Lucid, vivid, and illuminating, City of Thorns is an urgent human story with deep international repercussions, brought to life through the people who call Dabaab home. Ben Rawlence's first book Radio Congo was published to critical acclaim by One World in 2012 and chosen by the Economist as a Book of the Year. A graduate of SOAS and the University of Chicago, Ben has dedicated much of the past ten years to working as a researcher for Human Rights Watch. Ben is a frequent contributor to BBC Radio 4's From Our Own Correspondent, and has written for a wide range of publications including the Guardian, the London Review of Books and Prospect, as well as a panellist at the Frontline Club, Chatham House, the Royal Africa Society and the US Council on Foreign Relations.